Column 1: Lady Killer, Artula (3), Pink Lady, Lakewood (2), Rapid River (2). Coulmn 2: Larry, Mezger’s Special, Jungle Queen, Dr. Gray, Dr. White, Colonel Fuller (3). Column 3: Orange Miller, Don’s Special, General MacArthur, All Orange (2), Don’s Delight. Column 4: America (3), Chief, Carrie’s Special, P. L. B. No. 2, Judge, Larry’s Special (2). Column 1: Big Ben, Green Witch (2), Don’s Delight, G. Donald Bartlett (2), Kelley’s Killer (3). Column 2: Black Cat, Dazzlar, Blue Devil (2), Gray Ghost (2), Casablanca. Column 3: Larry (2), Jenny Lind (2), Gray Lady, Blue Dragon, Pink Lady. Column 4: Shang’s Special, Charles E. Wheeler, Shang’s Favorite, Canary Custom, Merry Widow, Lady Miller, Mrs. Duley’s Special. These flies as arranged on the Riker Mount batting were part of my fly display at L. L. Bean in Freeport, Maine on Friday, September 21st, 2012. That was the date I taught a classic featherwing streamer class from 9:00 AM to 4:30 PM. I returned before 7:00 PM that same evening to lead the regular Friday night fly tying class at Bean’s, but this event was special because of the organization between myself and Ed Gauvin, Assistant Manager at the Hunt / Fish Store, to host David Footer as the Guest of Honor in celebration of the 50th Anniversary of his classic Maine streamer pattern, the Footer Special. More on that in a subsequent post. The tying of Carrie Stevens patterns has been a journey for me. I was tying and fishing the Colonel Bates and Gray Ghost as far back as my high school days (my 45th Class Reunion is coming up in 2015). In the mid-1980’s I tied several additional streamer patterns of hers; the Green Beauty, Shang’s Special, Greyhound, and Don’s Delight, and included them in a slide program I first presented in 1987 on classic Maine streamers. Then in early summer of 2011 I began tying Carrie Stevens streamer patterns again, but much more in earnest than previously. I tied them in traditional eastern style as I had always done, adding about fifty additional patterns to the list of her patterns I dressed. Then a few months ago I had a very enlightening experience. While at the American Museum of Fly Fishing in Manchester, Vermont, I happened to see the enlarged display featuring the notes and drawings made by Austin Hogan, of Carrie Stevens unique tying methods, Austin was a friend of Carrie Stevens – her Austie’s Special pattern is named after him – and he was also the first curator of said Museum. When I saw them, I thought, “Cool!” and took photos of them. Not until a couple months later, at home, did I finally download these photos and begin to read the text of the notes and study the drawings. Long story short, Carrie’s tying style was not in typical ‘eastern fashion’ as other streamers were tied. She learned to tie flies on her own, never having taking lessons. She applied what she learned as a milliner – selecting, arranging, cementing and gluing feathers together. She also without doubt, incorporated bait fish design, learned from her husband and guide, Wallace Stevens, into her streamer patterns. 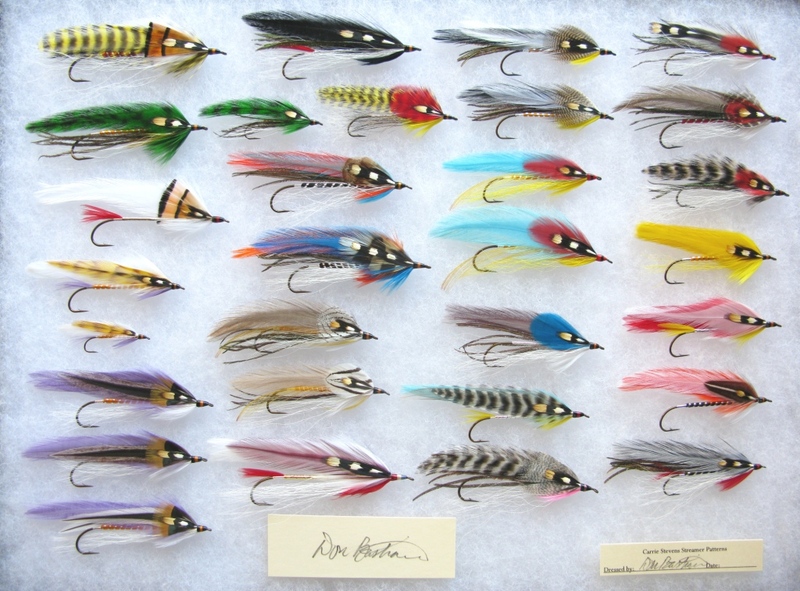 Her methods of material placement which I had actually seen but not really paid attention to in Streamer Fly Tying and Fishing, 1950, 1966, 1995, by Joseph D. Bates, are nothing short of ingenius. Reading Hogan’s notes and studying the methods, I realized that I was tying the Stevens patterns like most other tiers had been, adding the materials to the hook, following the recipe, but not in the particular fashion that she pioneered. I’ve recently had a couple long phone conversations with Michael Martinek, Jr. of Stoneham, Massachusetts. When he was young, Mike was taken under the wing of Austin Hogan and through that relationship, was exposed to a unique opportunity to learn how Carrie Stevens tied her flies. Mike told me that one evening in the late 1960’s, with Austin, in his apartment, he and Mike deconstructed three of Carrie’s patterns; a Gray Ghost, a Big Ben, and I believe, a Blue Devil. Michael Martinek is the sole source, besides Austin Hogan’s notes, of the information that has led to the resurrection of tying Carrie Stevens patterns in her traditional, authentic, Rangeley style. Mike has the original copy of Hogan’s notes on Carrie Stevens tying methods, hand-written, and he also has one of the first typewritten copies as well. Mike also has a number, more than a couple dozen, of sheets of paper with cellophane packages stapled onto them, with Carrie’s own wing materials and samples and pattern notes in her handwriting. All I can say on that is, wow. Carrie sold her business to H. Wendell Folkins in 1953, which is curious to note, that the Carrie Stevens patterns in Trolling Flies for Trout and Salmon, 1982, Stewart / Leeman, tied by Folkins, are not tied using Carrie’s metionds, but rather, are dressed in typical “eastern” fashion with everything attached at the head. In fact, some of the recipes have errors with missing components. The good thing is that many previously unknown Stevens patterns were published in that book. 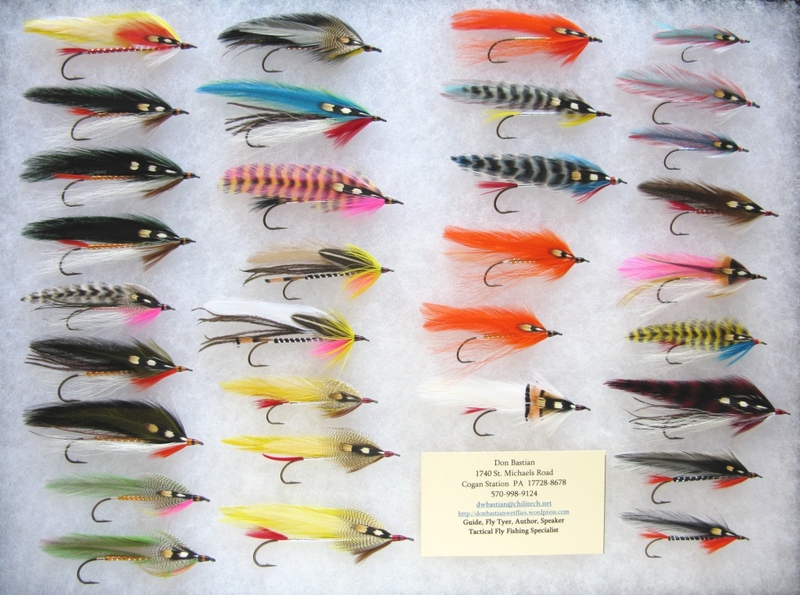 In 1996, Folkins sold the rights to “Rangeley Favorite Trout and Salmon Flies” to Leslie Hilyard of Massachusetts, who with his father Graydon Hilyard, is co-author of Carrie Stevens: Maker of Rangeley Favorite Trout and Salmon Flies, 2000, Stackpole Press. Mike has been teaching Carrie Stevens’ technique using her unique methods of applying the underbelly and underwing well behind the head of the fly for thirty years. The throat, of one or two colors, and finishing in some cases with a golden pheasant crest feather, is applied in stages, layered as one would when placing shingles on a roof. I’ve been doing this for some months now, and I can’t imagine how she managed that while tying in-hand as she did, never using a vise. This information is presented in Mike’s Streamer DVD, Classic Maine Streamers, Bennett- Watt Entertainment, Hooked on Fly Tying Series. It’s pretty difficult for anyone to say there is another person on the planet who knows more about streamers, their history, tying, tiers, origins, than Mike Martinek. Mike has taught a number of the other good streamer tiers such as Chris Del Plato of New Jersey; Richard Connors of Massachusetts; and Peter Simonson of New Hampshire. I’m certainly a johnny-come-lately to this party, but better late than never. I don’t really like to present information from an authoritative standpoint when I think I’m correct and turns out, I’m not. Oh, yes, some internet writers do that, unintentionally, (as I have unintentionally on occasion, by being uninformed), but some present what they know because they think they know it. It’s best to rely on fly tiers and writers with years of experience and credibility to back up their writings and knowledge. One more slightly sour note – last year my new head cement of choice was Wapsi Gloss Coat. After a couple months though I had a problem with it getting milky, gray, & blotchy. I learned it may have been because I was using regular hardware store lacquer thinner to thin it, turns out the use of the proper Wapsi Gloss Coat Thinner makes no difference. I’ve sold Carrie Stevens Collector’s Edition Sets on MyFlies.com, and I’m going to have to contact everyone who bought the sets when I was using the Gloss Coat to return them so I can re-do the bad heads. I can’t have bad cement ruining the reputation of my work. My friend Truman had the same problem; flies we tied in February at my cabin went gray on him. He poured the Wapsi Gloss Coat onto a log beside his driveway & trashed the bottle. A couple interesting notes to close and then I’m done. The Don’s Special and Blue Dragon are identical, except with the reversed placement of the blue and gray hackles in the wings. Also, the Don’s Special has a red-banded head; the Blue Dragon band is orange. Another little plus in my belief that her color banding was pattern specific. The Happy Garrison and Carrie’s Special are identical in every component except the throat. The Jungle Queen and Yellow Witch are identical in every detail, wonder why the two patterns were named differently? Finally Carrie was an accomplished artist with her minimal use of body variations in her one-hundred or more patterns. From just five basic bodies, she made all these flies look so different. Primarily, silver tinsel bodies, orange floss, red floss, and black floss, almost all with silver tinsel ribbing; and a very small number of gold tinsel bodies, like you can count them on one hand – Davis Special, Orange Miller, one of the P. L. B. patterns, and um, um, uh…oh the Casablanca. There may be one more. This was changed up only by the occasional addition of a tail, almost always of red, yellow, black, or orange hackle fibers. Another interesting note; the first mention of the Gray Ghost on the Upper Dam House log book was 1934. Not in 1924, as has been perpetuated for years. She did not catch her record brook trout on a Gray Ghost, but the log book reads on a “Shang’s Go-Getum.”. The Gray Ghost would come later. 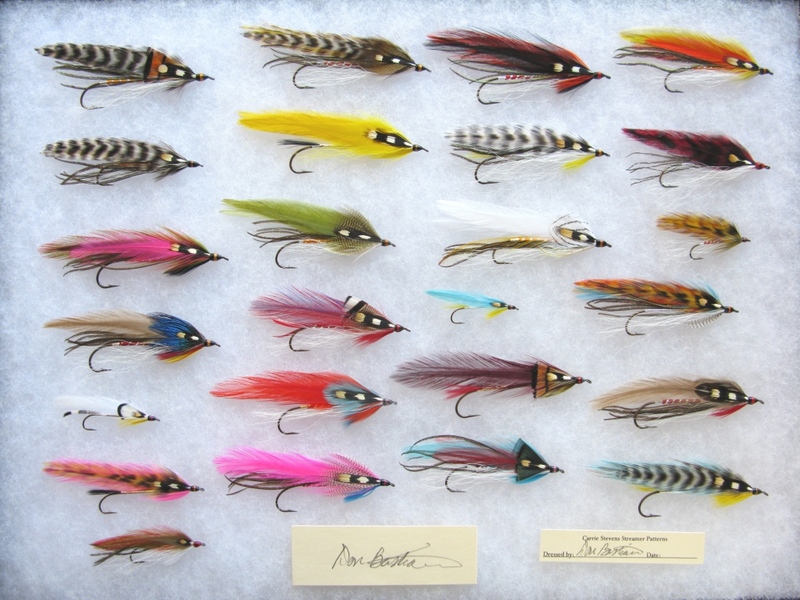 This entry was posted in Carrie Stevens Pattern Dictionary, Fish Stories and Other Tales, Streamers and Bucktails and tagged Carrie Stevens; Mike Martinek, L L Bean, Streamer Fly Tying and Fishing. Great post Don, I think you nailed everything in a nutshell lol The riker boxes look great and remind me I should be tying a lot more. Hi Darren, Thanks for your comment, but I think now (since I wrote all that from memory) that I made a few minor errors, I will change them…I really appreciate your input and support. On another note, at the Symposium, since I’m doing a Featured Tier demo at 10:30 Saturday, would you be able to watch my table for a bit? Thought I’d ask you and Chris Del Plato to split the hour…that would be a great help, thanks! That would be cool! Count me in. OK, thanks! My friend from PA who was going to come, can’t so I appreciate your assistance. It’ll be a pretty easy gig… 🙂 And I’ll buy you a beer for it as well! Good stuff Don. FWIW, I’ve always found this quote hits the nail on the head. In fact, it was part of a Classic Streamers presentation I gave to a local TU group last night. Thanks for your input, and posting that writing by Paul Schullery. I agree with that. Dr. Burke I believe, wanted perhaps to make the part of the pattern visible, but as Paul noted, maybe that’s how he would have tied it, not realizing that the fly design and material placement methods of Carrie Stevens was the integral part of her patterns. Thanks very much for your comment! Once again Don, your patient attention to detail, both historical and at the vise, is superb! I perhaps like best the Metzer’s Special; I’m a sucker for that bright blue! Very impressive work. Thank you for your comment and appreciation of my writing, photos, and tying. As I noted a good many of those streamers were tied in typical fashion; I seem to be bitten by a bug now to re-do them in the historically correct methods that I’m just learning. See, even with almost 49 years of fly tying experience behind me, we can learn new stuff. Thanks very much for your comment and compliments! Nice work, Don. Looking forward to seeing you at Danbury and Somerset. I’ll be tying at both. Hi Bruce, thanks for your comment and yes, it’ll be good to see you again! I was wondering about you, hadn’t heard from you in a bit…thanks for your compliment on the flies! I appreciate it! Don, Your writing and historical observations are as good as, ifnot better than your tying. I greatly enjoy all your musings! Thanks so much for your comment! And compliment. I had a guy tell me back in the early 1980’s when I wrote a story for our local TU newsletter, “damn fine article,” and that he “thought I missed my calling.” I do like to write, creatively, sometimes like anything, it flows better than others. So appreciative of your support Joel. I am happy you like the history and “such.” Thank you very much sir!